The 2013 Porsche Mobil 1 Supercup season looked destined to offer British racer, Sean Edwards his greatest championship victory to date. However, after being killed in a track day, Nicki Thiim was provided with a bittersweet title triumph. 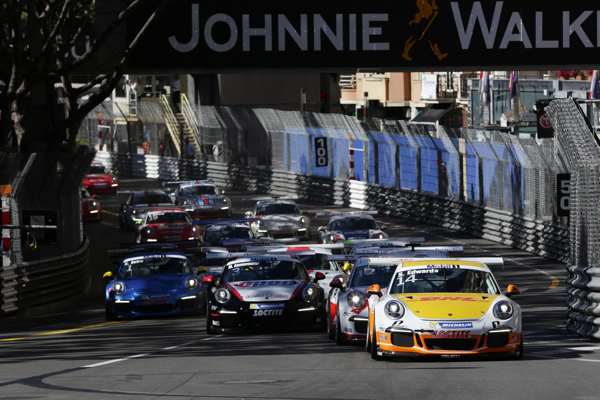 Total 911’s 2013 season review charts the peaks and troughs of the Porsche Mobil 1 Supercup’s most emotional season yet, the first for the 991 GT3 Cup car. Barcelona was the host for the 2013 Porsche Mobil 1 Supercup’s opening race, with Sean Edwards starting his season in the best possible fashion. After securing pole position, the talented Briton decimated the field to win by over seven seconds. Edwards started the season in sterling fashion, winning from pole in Barcelona. Behind though, the action was fierce. Initially, Kuba Giermaziak and Michael Christensen led the charge, with Michael Ammermüller in close tow. However, at the halfway point, Christensen locked up, allowing Ammermüller into third. Nicki Thiim, charging through from tenth on the grid, also chose this moment to pounce, usurping Christensen for fourth. Although the podium now looked set, Thiim’s rise through the order was to continue on the final lap. As Ammermüller looked to move passed Giermaziak the Pole defended, slowing both of them, and allowing Thiim to finish second after an astonishing drive. Ammermüller wound up third as Giermaziak missed the podium in fourth. Escaping the hordes at the start, Edwards built up a 20 second lead en route to victory in Monaco. The second round of the Supercup took place amidst the glitz and glamour of the Monaco principality. The streets of Monte Carlo had been a happy hunting ground for Sean Edwards, with a victory in 2012 his only win that season. 2013 proved similarly successful with another pole position, and another lights to flag victory. In fact, the tight and twisting streets meant that the top five all finished in their qualifying positions. Over 20 seconds behind Edwards, Kuba Giermaziak made up for missing out on the podium in Barcelona, as Michael Ammermüller unsuccessfully hounded the Pole for second place. 2013 confirmed Edwards as the master of Monaco in a 911 GT3 Cup car. After a poor qualifying session, Nicki Thiim had to settle for eighth place around the 3.34-kilometre stretch of street tarmac. This left Edwards with an eight-point advantage over Ammermüller in the title standings, with Thiim dropping to fourth. The theme of winning from pole position continued at Silverstone. However, this time it was not Sean Edwards at the head of the field. Instead, after two poor qualifying performances, it was Nicki Thiim who snatched pole position at the third time of asking. When the lights went out to start round three, the Danish racer took off, building a lead he would never relinquish. Behind, Michael Ammermüller had made a lightning start to jump from sixth to third on the opening lap. Thiim had to wait until round three to register his first victory of the season. After patiently waiting behind Porsche Junior, Michael Christensen, the German driver made his move on lap seven, taking second (and his third consecutive podium). Edwards saw his championship lead cut to just four points after finishing fourth. The famous Nürburgring was the venue for the Supercup circus’ fourth stop of 2013. While the Grand Prix circuit is not as fearsome as the Nordschleife, its 5.15 kilometres still provided the Porsche 911 GT3 Cup racers with a stern challenge. Surprisingly it was Porsche Junior (and first-year Supercup driver) Michael Christensen who rose to the challenge best. Qualifying saw the Dane take pole position by the slightest of margins, with Kévin Estre less than a tenth of a second slower. Christensen’s stunning debut year in the Supercup included this win at Nürburgring. In the race, Christensen continued the poleman’s tradition of taking a lights-to-flag victory, romping home 1.661 seconds ahead of a hard-charging Nicki Thiim, and cementing his place atop the Rookie classification. With his countryman up the road, Thiim leapfrogged Kuba Giermaziak’s 911 GT3 early in the race, before passing teammate, Estre with five laps left. Estre then came under extreme pressure from Sean Edwards as Giermaziak spun out of contention. Estre managed to resist the attacks from the Briton, who eventually settled for fourth place, keeping his championship lead at four points over Thiim (as Michael Ammermüller finished off the podium for the first time in fifth). Second place vaulted Thiim into the championship battle. In the sweltering heat of the Hungarian summer, Sean Edwards confirmed himself as one of the brightest talents of the 2013 Porsche Mobil 1 Supercup season with his third victory of the year. The British driver, after securing pole position on the Saturday, led from start to finish. However, extending his championship lead to 16 points over Nicki Thiim was not easy, with race-long pressure from Christian Engelhart. Behind the battling lead duo, Kuba Giermaziak made up for the disappointment of his Nürburgring retirement with third as Thiim, starting fourth, dropped through the field to eventually finishing eighth. After dominating the opening two rounds of the year, Edwards returned to the top step in Hungary. Thiim’s teammate, Kévin Estre continued his good run of form with fourth, but it was a tough race for Michael Ammermüller who could only manage 14th after clashing with third-placed Richie Stanaway at the start of the race. Spa-Francorchamps is arguably one of the last great circuits. Sweeping through the Ardennes forest, the Belgian track is one of the Supercup drivers favourite tracks. However, for Kuba Giermaziak, it was the venue for heartbreak in 2013. After taking his first pole position of the season, Giermaziak was on course for his first win of 2013 too. Unfortunately for the Pole, his Porsche 911 GT3 Cup car developed a gearbox malfunction on the very last lap, demoting him to 11th. Heartbreak for Giermaziak gifted victory to Bachler, his first in the Supercup. This allowed Klaus Bachler to take his maiden Supercup victory after soaking up the pressure from championship leader, Sean Edwards. Nearly three seconds behind the lead duo, Michael Christensen scored another podium in third. Nicki Thiim’s title hopes took another knock in Spa though. After qualifying ninth, the Dane was on course for seventh before a recovering Jeroen Bleekemolen charged back through in the final laps, pushing the Dane down to eighth. Heading to the super-fast Italian circuit, Nicki Thiim was now 26 points behind runaway points topper, Sean Edwards. However, as summer drew to a close, the Dane looked to put his title charge back on the rails. Thiim’s second victory of the year ensured that the title would go down to the wire. After the poleman failed to win at Spa (for the first time in 2013), normal service was resumed at Monza. Despite intense pressure from Michael Ammermüller, Thiim led every lap to record his second win of the season. Behind Ammermüller (who continued to search for his first Supercup win), Kévin Estre battled through from eighth to round out the podium. Edwards was denied fourth by Christian Englehart, ensuring that the title would go down to the double-header in Abu Dhabi. With a two-month break before the title decider in Abu Dhabi, tragedy was to strike the Porsche Supercup paddock. 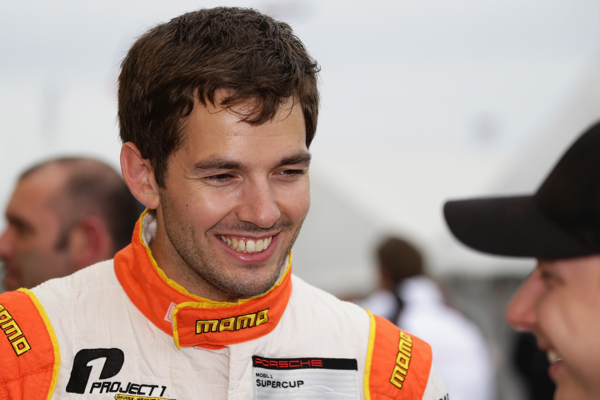 At a private track day in Australia, champion elect, Sean Edwards was killed while tutoring another driver. Edwards was sorely missed in the Abu Dhabi paddock. A huge hole had been blown in the close-knit Porsche fraternity, with calls for the championship finale to be changed to a non-points round, ensuring the late Edwards a posthumous title. As it was, points were still on offer at the Yas Marina circuit, with all the Supercup drivers racing in memory of Sean. Nicki Thiim, Edwards’ closest rival, led the charge, winning the opening race of the weekend after pressuring guest driver, Earl Bamber into a late mistake. Two victories gave Thiim a bittersweet championship crown. It was fitting too that round nine saw Jeroen Bleekemolen (a close friend of Edwards) finish the season with his first podium since 2011. However, results didn’t really matter come the close of the season. The Supercup had a new champion but, despite Thiim’s sterling performances across 2013, Sean Edwards will be the name that many remember after this year, hopefully for his many incredible performances behind the wheel and not just his untimely passing.